Be Heard. Be Seen. Be Remembered. 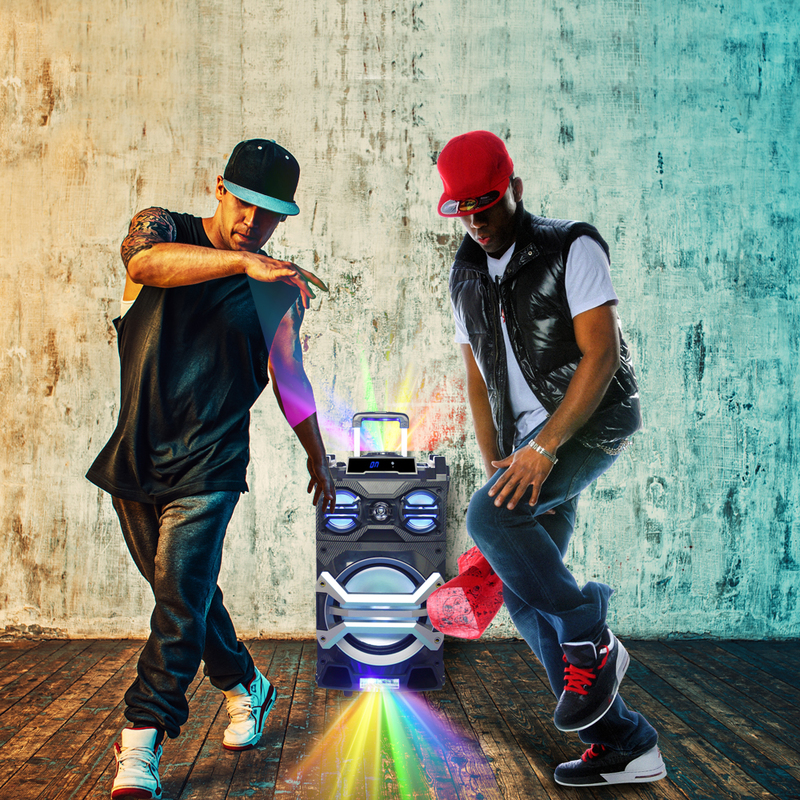 Just add music to get the party started and the built-in disco lights will do the rest. 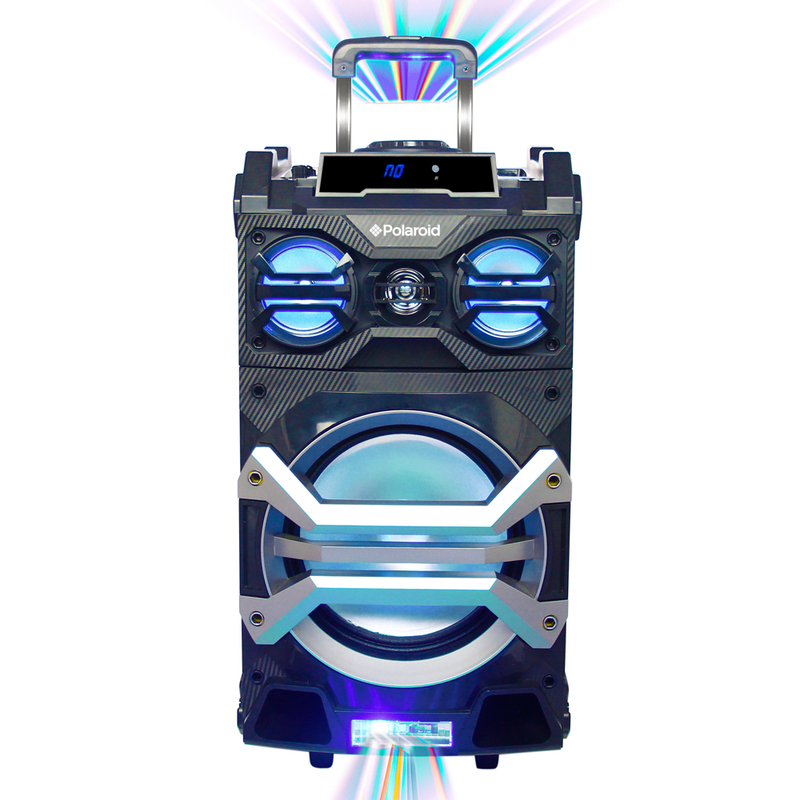 These versatile speakers have loads of extra features, karaoke function, external audio/ microphone input, FM Radio connectivity, USB input as well as the ability to record music from these modes. The Polaroid Portable Trolley Speaker also comes with one wired mic. It has a retractable handle and wheels for easy transporting. Ultra-large magnetic circuit high-sensitivity speaker with high penetrating power, low-frequency shock and perfect medium-high-frequency representation. The latest decoding chips supporting playback of MP3 in up to a 32GB USB disk/TF card. FM radio – high-quality digital radio with automatic channel search and storage of up to 60 channels. Built-in high-capacity battery for consecutive playback of up to 4 hours (may vary depending on function). Wired microphone for voice and Karaoke function. Built-in low battery and full recharging indicator. Retractable trolley handle for ease of transport. Outputs to earphone or external sound sources. Record your favourite FM radio station or other AUX sound sources. Microphone input recording to act as your personal business assistant. Laser Lights for that “In the club” feeling. Power Source: DC Operation, 12V 1A. AC in for Battery Charging. 2 Channel independent volume control. 10” and 2x 4” speakers.